A garden to attract hummingbirds’ should provide food, water, and shelter. Hummingbirds need shrubby plants in which to nest and get out of inclement weather. They like evergreens, dense shrubs and vines. They especially like trees that have small stems on which they can perch. Hummingbirds do not visit traditional bird baths, as most of these water sources are too deep for them. They prefer to bathe and drink from droplets of water or spray mists. They often drink or bathe in cupped leaves of flowers or swoop through sprinkler sprays. 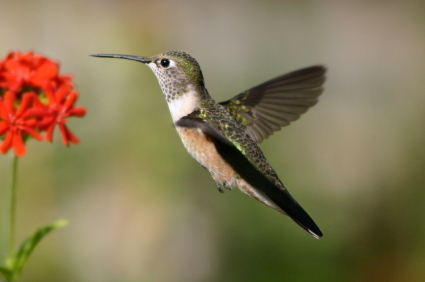 Hummingbirds require multiple food sources, which includes small insects, sugar, and pollen. These flying jewels prefer natural flower nectar over sugar syrup, though they will take advantage of our feeders. Small insects, such as aphids, whiteflies, gnats, and mosquitoes provide protein in their diet and are the major food for their young. They also consume the pollen from flowers. Since these birds are so small and need so many insects, we really should not use pesticides or insecticides n the garden, as they can be quite harmful to our birds. Hummingbirds also use spider webs to build their nests. Since hummingbirds need lots of food to maintain their high metabolism, they need nectar to be available all the time. This is not an easy task, as few plants bloom continuously from March to October. This means that we need a wide variety of plants in the garden to provide for the birds’ needs. It is helpful to include perennial and annual flowering plants. Trumpet type blooms in all sizes work great for the bird to sip nectar from the flowers. We also need to provide a range of plant types and heights from trees to shrubs to flowers. Check in our garden center for a list of plants that will feed hummingbirds that you can plant in your garden.